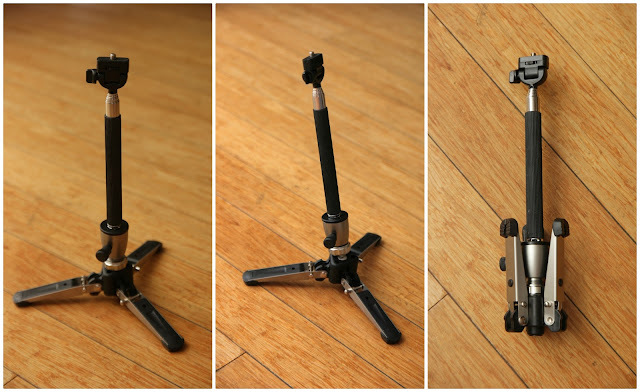 BeStableCam’s mini tabletop tripod is a compact tripod with several uses. Here is a review. BeStableCam’s mini tripod is a compact tripod designed primarily to serve as a tripod for 3-axis gimbals. BeStableCam sent me a unit for review. Here are my thoughts. The tripod is made of plastic and stainless steel, and seems very sturdy. Because it has many steel parts, it is heavier than a similar size tripod that is made of aluminum. That weight is a benefit and adds to its stability. The tripod’s legs fold up for storage, although it would still be a little chunky. When ready to be used, each leg has a button that you press to release each leg. When opened, the buttons will lock the legs in place. The tripod’s radius is about 4.5 inches. The tripod has an intergrated ballhead with a standard 1/4-20 tripod attachment. The ballhead can be locked into vertical position with a collar. When the ballhead is not locked down it can be angled up or down around +/- 20 degrees or so. The ballhead can’t really be locked into an angled position (when the ballhead is at an angle, the collar can be used to block the ballhead from dropping down on one side but not on the opposite side). On the side of the ballhead is a knob, which when loosened, allows the tripod attachment (and anything attached to it) to rotate freely. The tripod has several uses, as shown below. 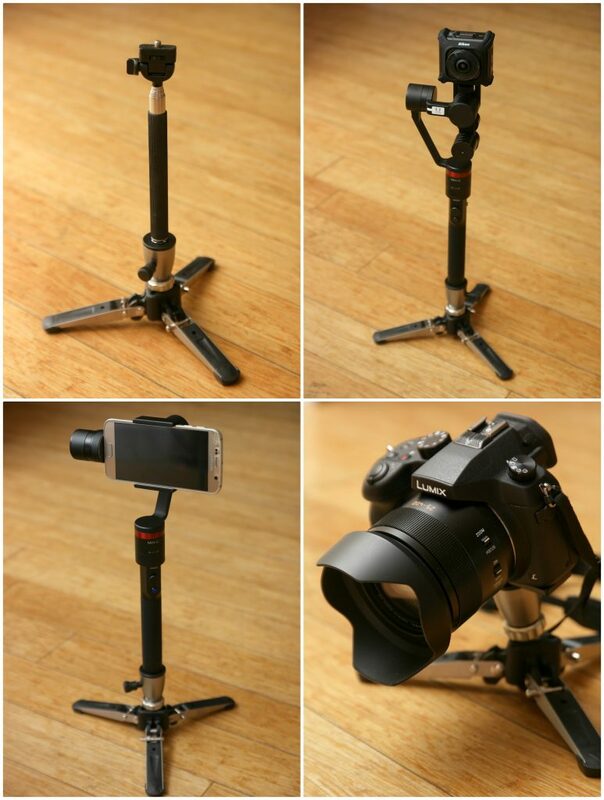 The tripod can be used with 3-axis gimbals, almost all of which have a 1/4-20 tripod attachment at the bottom. Here, I’m showing it being used with a Moza Mini-C gimbal for smartphones. It can also be used with a Guru360 gimbal for 360 cameras (reviewed here). The BeStableCam tripod can be handy for setting up the gimbal (e.g. to balance it). It can also be used to enable the gimbal to stand on its own for static shots. In that regard, it makes the gimbal quite stable (if you use the collar ring to lock down the ballhead). On the down side, when the BeStableCam’s legs are folded up, they may push up slightly against your hand or wrist. You can mitigate this by rotating the ballhead just so. The BeStableCam can be used as a tripod for selfie sticks. Here’s how the nadir looks when used with a Xiaomi Mijia Mi Sphere 360 camera and the slim selfie stick shown above. The tripod is reasonably stable unless you extend the selfie stick to its maximum length and you tilt it, in which case the radius of the tripod may not be wide enough to support the tilted selfie stick. Another way that I like to use the mini tripod is for directly attaching it to a camera (360 or otherwise) or a smartphone (with a smartphone adapter) as a tabletop tripod. It is stable enough that it has no problem supporting a bridge camera such as a Sony RX10 or Panasonic FZ1000. It can be used to support an interchangeable lens camera with a heavier lens such as my Samsung NX500 with 16-50 f/2-2.8 OIS (the fast standard zoom, not the 16-50 f/3.5-5.6 kit lens) but only either locked into vertical position, or fully angled up or down. Here it is shown at its maximum tilting angles. In summary, the BeStableCam mini tripod is a well-built tripod that is versatile and can be used as a small tripod for your gimbal, selfie stick or camera. It also costs less than some mini tripods with comparable capacity. 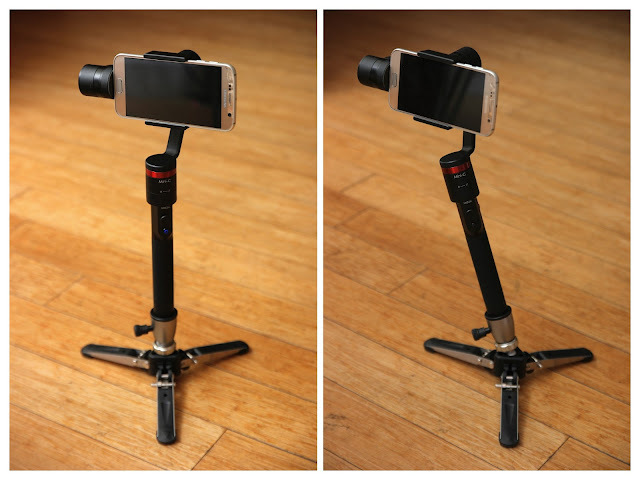 BeStableCam mini tripod is available from Amazon.